Fast & Furious 6 (alternatively known as Furious 6 or Fast Six) is a 2013 action film directed by Justin Lin and written by Chris Morgan. It is the sixth installment in The Fast and the Furious franchise. The film stars Vin Diesel, Paul Walker, Dwayne Johnson, Michelle Rodriguez, Jordana Brewster, Tyrese Gibson, Chris Bridges, Sung Kang, Luke Evans, Gina Carano, and John Ortiz. Fast & Furious 6 follows a professional criminal gang led by Dominic Toretto (Diesel) who have retired following their successful heist in Fast Five (2011), but remain wanted fugitives. U.S. 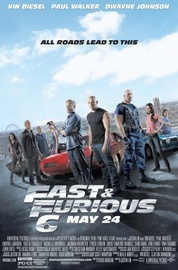 Diplomatic Security Service (DSS) agent Luke Hobbs (Johnson) offers to clear the group's criminal records and allow them to return home in exchange for helping him to take down a skilled mercenary organization led by Owen Shaw (Evans), one member of which is Toretto's presumed-dead lover Letty Ortiz (Rodriguez).